In plumbing, as with life, the little details matter. Having just spent the better part of two days replacing a hot water heater, I can attest to this. My old water heater sprung a leak, and had to be replaced. Countless time was spent vacuuming up water. My first indication that there was a problem was a lack of hot water in the shower. Which led me to investigate. Whereupon I discovered the mess you see. And as anyone knows, a little thing like water can cause a lot of damage. (My house will be getting checked for water damage and/or mold tomorrow). A plumbing company furnished an estimate, but it of course came in pretty high. I figured I could do it for less. While I would love to go tankless, it just wasn’t in the cards. I went conventional electric with a model comparable to what I had. The first step was shutting off the power to the existing unit. After that, I vacuumed up what seemed to be gallons of water. Then I set the existing unit up to drain. And happily went on my way to Home Depot, coming home with the white model you see above. Did I mention I went to Home Depot? I did? Because I made many trips there during the course of this project. 🙂 My favorite (NOT) was going there to get a stand after discovering that the old heater had not, in fact, drained (despite appearing like it had). Science tells us that 1 gallon of water weighs 8.34 pounds. 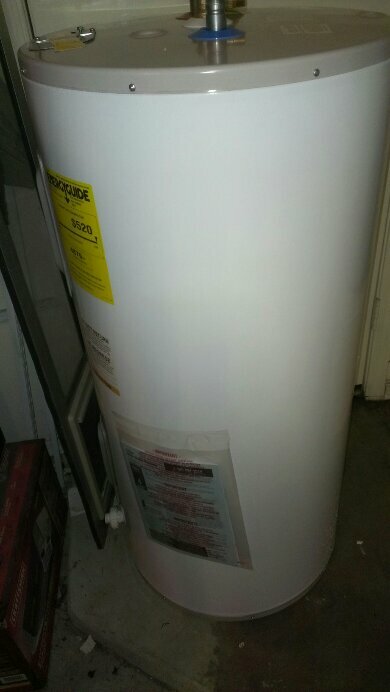 Thus a full 50-gallon water heater weighs somewhere in the neighborhood of 450 pounds (weight of the unit + 417 pounds of water). Despite the setback, I was determined to get the unit up and running anyway. So back to Home Depot it was to get a stand. I would setup the new beside the old. The line for the pressure relief valve wasn’t long enough, and the supply line picked right then to quit working. How was I to fill my new hot water heater? I gave up for the night. After a (poor) night’s rest, and making YouTube my dad (on account of never getting to work shoulder-to-shoulder with my own), I awoke (if not rested) knowing what to do. It’s a good thing I didn’t fill the new water heater. Instructions online indicated a novel action might help my old heater to drain: force water into the drainage spout to clear out the sediment. So, yes, it was back to Home Depot for a hose bib. I, of course, bought the wrong part in this initial foray, and had to return to return it and find the correct item. After my second trip to Home Depot of the day, hose swivel in hand, and armed with my new found knowledge, I was ready to make the magic happen. 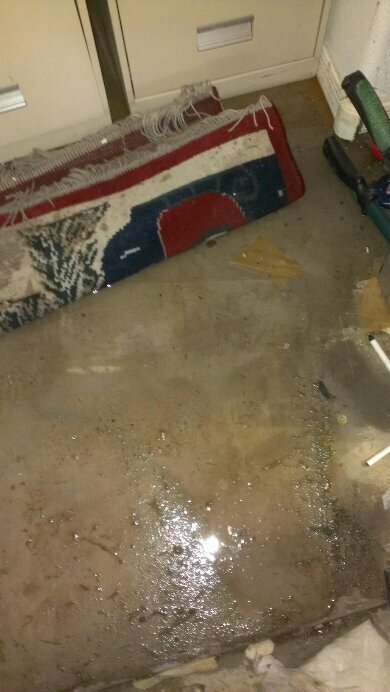 I just didn’t think that clearing the line of sediment would blast the ceiling, wall, and floor with jets of water! You guessed it: more vacuuming commenced. But then I was able to in fact drain the old hot water heater. I want to say it took about an hour, or so. Thus empty, I was able to move it off its pedestal, and slide the new one over. 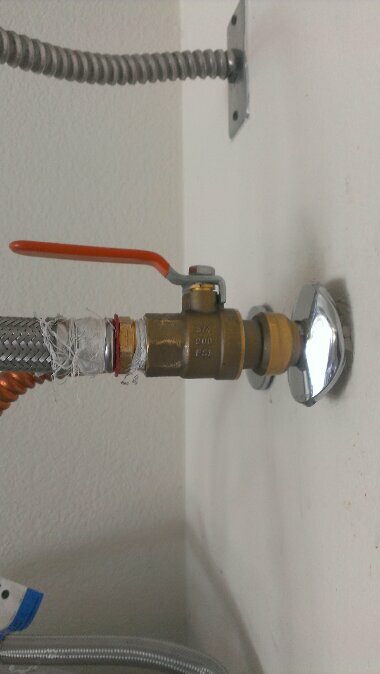 I proceeded to connect everything–including the new Sharkbite valve I’d picked up at Home Depot. Sharkbite slide on valve. One of the best inventions ever. I was ready to wire up the electric, and stick a fork in this–because it was done, baby! It was leaking! All over the place! Without it, virtually all of my new hoses were leaking where they were screwed together. And the whole point of this entire exercise was to eliminate leaks! Back to Home Depot I went! Tape thus procured, I was ready (and so were my wife and kids) to put this thing to bed! Returning home, I vacuumed yet more water, tripped the T&P valve (to release built up pressure), and tape-covered all of my fittings). Reconnecting the electric was a cinch by comparison (nota bene: turn the power off at the breaker box before doing any work like this) . It worked! It wasn’t leaking! I saved a bunch of money! And learned a thing or two in the process! Calloo, callay! Oh, frabjous day! Now if you’ll excuse me, I need to shower–I stink.